World Muaythai Council » Challenger Muaythai Fight Series 9 – ‘FIGHT TO THE FINISH’. On Friday January 24th, Mike Miles Productions under the sanctioning of THE wmc THE WORLD GOVERNING BODY opened 2014 presenting Challenger Muaythai Fight Series 9 – ‘FIGHT TO THE FINISH’. The event was sold out again turning away several hundred people at the door. Mike Miles Promotions is again searching for a larger venue to host these events in. 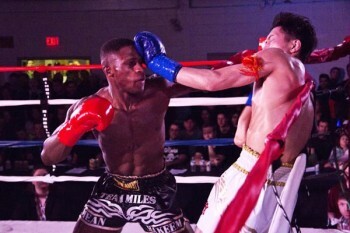 Dawodu (left) – Dawodu delivers the head shot which set up for the final body hook. As the athletes entered the ring, the Japanese athlete was taller, well muscled, and had long arms for his size. Dawodu looked well muscled and fit to fight as well. As the bout opened Dawodu was to attempt his opening front flying push kick but the Japanese athlete was not to be there. As the two started moving both men looked sharp with the Japanese providing a tight and strong defence picking off the majority of the Canadians attacks. About a third of the way into the round Dawodu landed a vicious left body hook that visibly hurt Hirai. Dawodu could smell blood and started pressing the Japanese athlete to the ropes with a flurry. A head shot knocked Hirai off balance and Dawodu stuck another huge left body hook in with a resounding thud in the venue, dropping the Japanese athlete to the canvas for the count and beyond. The result was 1st round TKO for Hakeem Dawodu and the crowd gave him a standing ovation. This was a big fight for both athletes. Bragging rights and a boost to the future and direction of these athletes in Japan was at stake in regards to the outcome of this bout. The Canadian athlete won it opening more doors of opportunity for him in Japan. The Canadian fought in Japan in November and had a great scrap with a well known Thai athlete (Gunapper Weerasakrek) eventually seeing the Canadian win by KO in the 3rd. MacKinnon (right) – MacKinnon lands the back kick which finished the bout. 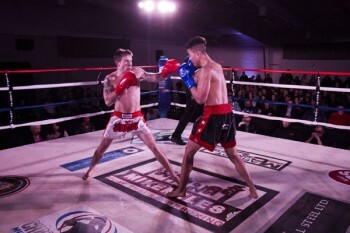 Mackinnon stepped into the ring for his second Professional Muaythai bout. His opponent Waterhen, was sitting on 30+ professional bouts… but all having been in MMA in a cage. Waterhen had been former King of the Cage Canada Canadian Champion. As the bout opened MacKinnon started fast off the line and was landing some good shots while Waterhen’s experience blocked and parried many of the head kicks and low kicks. In the second round a knee had struck Waterhen in the head and MacKinnon poured on the pressure but the cagey Waterhen nullified the attacks and recovered. He was then to press MacKinnon who started to show some fatigue and stepped up his work rate. In the third round Mackinnon was to settle down again and land some good punches and kicks while Waterhen continued to fight back. At midpoint of the round MacKinnon forced Waterhen to the corner and he delivered a spinning back kick which caught Waterhen in the liver. Waterhen went down for the count. Mackinnon was to state he had a difficult time dealing with the strange rhythm of the MMA athlete. 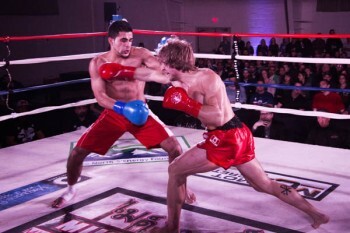 Mark MacKinnon was declared winner of the bout by 3rd round TKO in his second professional match. The bout opened with Omori on the outside providing movement and throwing single shots and MacKenzie. Omori was having a difficult time trying to catch the Canadian who moved backwards as soon as the Japanese athlete would move forward. In the second round, MacKenzie was to settle down in his stance more but still looked like he was trying very hard for a knockout. Omori fought back but was dropped several times in this round. In the third round MacKenzie settled down a little bit more and managed to force Omori back to the ropes. MacKenzie was working to land knees and elbows for a KO. But Mackenzie’s aggression was too much for Omori who was dropped for a final time in the third round. Scott MacKenzie was awarded the win by 3rd round TKO. When both athletes entered the ring, the most striking difference between the two athletes was the difference in size. “It is so hard to find juniors in the same weight division with comparable experience. Ethan usually fights at a division or two lower than this weight. However, I was having difficulty finding him and opponent and Rino (Belcastro, Laramie’s coach) contacted me and we took the bout,” said Mike Miles. The opening of the bout had Laramie dictate the pace. Doucette landed some good kicks but Laramie would press through and land some very strong punches. Laramie was very aggressive in the clinch using his skills to out strength Doucette in the clinch. In round two Laramie again dictated the pace and Doucette would fight back but started hesitating on pulling the trigger. Laramie started landing some very strong body shots. Doucette was shook at the end of the second round. In the final round Laramie pressed forward and as the round progressed Doucette resorted to the shell. Laramie started pounding in some body shots and head combinations and the referee decided to halt the bout. Todd Laramie was to win the bout by 3rd round TKO. A big star in the future who was to win the Willie Williams Memorial Best out of Town Fighter Trophy. Weigel (right) – Weigel punches at Sandhu. Weigel was originally slated to face a different opponent but due to weight discrepancies this was Weigel’s to be bout for the night. A very exciting bout which see sawed back and forth between two game athletes. Sandhu was very explosive on the outside. Weigel was to answer effectively during this bout. Sandhu was to try and stay on the outside throughout the fight to exploit his height advantage. Most of his shots were wide and none had Weigel in trouble at any point, in fact Weigel walked through the majority of the shots. To Sandhu’s credit he stayed out of the clinch and nullified most of the clinch game. Weigel was to pitch Sandhu to the ground twice to which Sandhu retaliated once. The bout was close with Hasman Sandhu winning the decision. A very exciting fight. Leading into this event Quinn had three prospective opponents pull out on her. The lightest prospective bout was at 115 lbs. Taking the fight on short notice, KruDar offered up his 2013 TBA World Class Novice Champion Sarah Hoedlmoser. Quinn thus had to move up 130 lbs. for this bout. Both athletes started off the fight with some aggressive shots. Quinn had to reach as she was six inches shorter. In the first round Quinn was the more aggressive of the two though Hoedlmoser protected very well and answered with some beautiful kicks. Heading into the second round Hoedlmoser started picking up her work rate too. Towards the end of the round Hoedlmoser, started working her knees and clinch and it was effective. Quinn was having difficulty dealing with the clinch which Hoedlmoser applied to keep Quinn away from grabbing the body to nullify the kicks. The final round was to be the round that would get the win for one of the girls. Both girls met in the middle of the ring and the two exchanged furiously with punches and kicks, each trying to answer the others. Hoedlmoser added in some great long range knees in the middle of the round and that was to win the bout for Hoedlmoser. This was a great action packed bout from the only women’s fight on the event. The win was awarded to Sarah Hoedlmoser from KruDar’s in Toronto. Collins (left) – Collins trying to find his range with Nguyen. A few weeks before the event was to take place there was a shuffling of matches due to pull outs and add ins. This match was originally supposed to feature Weigel against Nguyen and Collins was supposed to fight Sandhu. To accommodate the huge weight differences a decision was made to shuffle these two bouts around. Collins fights around 135lbs, but went up to 147lbs to take the match. Stepping into the ring both athletes looked fit though Collins did look smaller in stature. Nguyen has worked really hard on his boxing and it showed in this bout. Collins could not find his range and though he did score some shots, Nguyen would always try and answer to finish the exchange. In the second round Collins took a punch and went down for an eight count. He did manage to get back to his feet and started shaking off the cobwebs. Nguyen managed to place Collins on the ropes and landed a punch which wobbled Collins and then followed up again with another punch which dropped Collins for the TKO. Nguyen looked very improved in this match. The result was a win by 2nd round TKO for John Nguyen. The bout opened with both athletes trading some hard leather. The two were exchanging when Nelson spun and caught Mann with an unpadded back elbow (was meant to be a spinning backfist) and dropped Mann onto the seat of his pants. The referee was in the wrong position to see the blow and gave Mann a standing eight count giving Nelson a 10-8 round. As soon as Mann stood up Nelson apologized to Mann for the blow. The two continued trading leather and kicks throughout the bout. At the end of the bout, Nelson was given a split decision winning the bout. However at the end of the bout a protest was filed due to the illegal technique affecting the outcome of the bout. At the end of the evening, the jury overturned the decision at the bout has been recorded as a no Contest. A very exciting opening match with White aggressively taking the first round. As the bout continued the second round was very close. In the final round the tide had turned for Javier Ortega who was to take the win by split decision. A great opening bout. This entry was posted on Monday, January 27th, 2014 at 5:19 PM	and is filed under News.